How to best celebrate 25 years? How to best celebrate 25 years of business success and customer loyalty was never going to be a big challenge for Ashley Burrell, owner of Abtec Audio Lounge, the Petone-based automotive and home audio company. 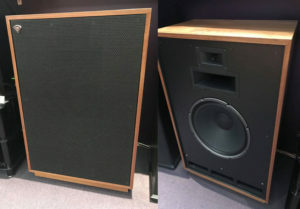 The experienced industry player has hit on a winner idea with a generous giveaway of state-of-the-art American audio speakers worth a massive $10,000. To be in to win the handmade Cornwall speakers entrants simply have to visit www.abtec.co.nz anytime in May and click on the Promos button and leave their details. “I’ve been told this is madness, I’ve talked to the big industry companies and they say there’s never been a give-away anything like this before. “We have a lot of loyal customers and this $10,000 give-away is our giving something back … there’s going to be one very lucky person out there. “I have always liked old school stuff with stereo equipment and nothing comes near the sound of these things,’’ Ashley says. 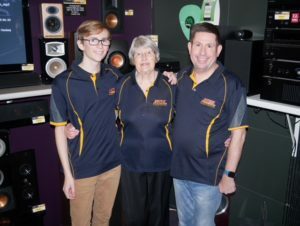 Reaching the quarter-century mark comes at a poignant time for Ashley and the family audio business which operates from its purpose-built building on the corner of Hutt Road and Riddlers Crescent. The 25-year celebration giveaway will also serve as a way for Ashley to recognise the contribution made by his mother, Yvonne, to Abtec from its very start to the present day. Unfortunately Yvonne is battling serious health issues and while Ashley is helping in every possible way with her care he also wants Abtec’s celebrations – which will include his mother drawing the name of the lucky winner on June 5 – to serve as recognition of her contribution. Ashley laughs when he remembers how his mother gave up the dining room when he was setting up the business in their Whitby home in the early 1990s. With Ashley’s son Jeremy now part of a loyal Abtec team also including his wife Narelle and brother Darryl, it means three generations of Burrells are involved, a point of pride and for the 52-year-old business owner. “It’s a real family affair and we’ve got a lot to celebrate.